I am still getting back into the swing of actually documenting my projects but I just had to share this particular one. Going though the pictures on my camera, I realized I have quite the backlog of projects to share. I really looked forward to making this quilt for my new niece. 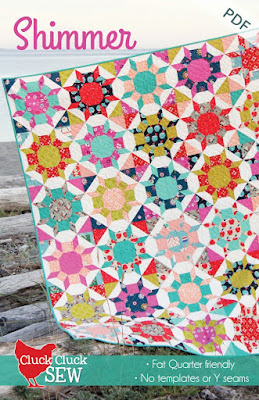 Her mum is a quilter friend too and we love a lot of the same colors, particularly red and aqua. I had a pull selected for her quilt long before I decided on the pattern. I kept waffling between Modern Vintage by Bonnie and Camille (in American Patchwork and Quilting) or something else. And then Alison Harris of Cluck Cluck Sew released her new pattern Shimmer. And I was sold. The baby version consists of nine blocks which was perfect. The way the quilt is constructed, there are a lot of little corners that are cut off. I decided ahead of time that instead of just cutting them off and throwing them into my scrap bin, that I would bite the bullet and make them Half Square Triangles (HSTs) right off the bat. So for every seam I sewed that would involve the removal of triangles, I would sew a line a 1/2" away and then cut as normal. This made a generous pile of half-square triangles to trim and press but I knew that I would be more likely to use them this way than if I let them get lost in my scrap bins. I used a Hello Darling pink strawberry print to back the quilt - I absolutely LOVE this print and wish I had a bolt of it. For quilting, I fell back on my new favorite free motion quilting, swirls and hooks. It adds so much texture and I just love the effect. Since time was of the essence, I machine bound this quilt with a lovely mint from Pat Sloans collection, whose name evades me at the moment. While it was a bit of a gamble that I would finish this quilt in time, sometimes, that crazy self-inflicted pressure can brew the best ideas. Case in point, not wanting to tear apart the closet to find gift wrap, I wrapped this quilt in tissue and then in a favorite and hard to find print from Aneela Hoey's Sherbet Pips line. Tie it with twine and call it a day. :) And since it's going to a quilter, I know they'll use it and there will be no waste. Win win. I'll have more later this week on what became of all those little HSTs. Can't wait to share that project!